There is something about the ‘country lifestyle’ that makes people in the city somewhat envious. Being carefree and relaxed always sounds good to city goers. 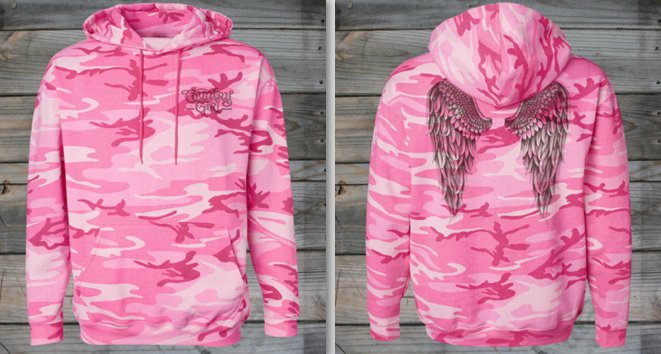 You may not be living in the countryside, but you can still get the feel of the country through clothing like this Angel Wings Pink Camo Hoodie that are adorable for any women to wear. It is so relaxing just to look at either one. They are very comfortable and warm enough during the cold days, yet cool enough even in the spring time. The Juniors glitter kiss tank & flannel pants will surely feel comfy when strolling in the summer and looking good. All of these products are so nice looking, they are made with high quality materials and the comfort and style is what I love the most when wearing these products from countrygirlstore.com. If you want some country lifestyle in your wardrobe, then I suggest you check out this place countrygirlstore.com, become their Facebook and Twitter fan and you will surely glad you did.